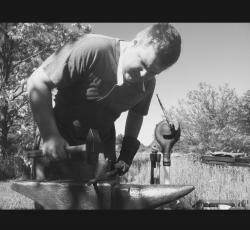 Bayshore Forge replied to Bayshore Forge's topic in Hot Cuts, Anvil devils, metal cutting on the anvil. This thing looks pretty darn cool. What type of stock did you start with? 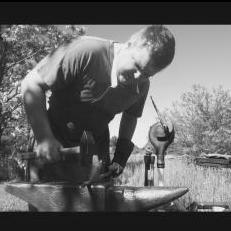 I have never seen any like this before, although I am new to blacksmithing. Would it be possible to get a little explanation on how to make these? Measurements? It looks to me like they are adjustable scrolling tongs, but I'm interested to know if with a different shaped jaw it could work with a variety of flat/square stock sizes. Thanks! Hey all, so long story short I told a friend I'd make him something if he gave me a pile of scrap metal. He said he would be interested in a grapple hook. Initially I thought, SWEET! Now before I start I have some conflicting theories in my head. I'm thinking spring steel because I'm scared mild might snap or bend uselessly if he ever used it for anything. So then I'm thinking harden it, but where to temper it so it doesn't break? The arch of the hooks? Should the arches have a round cross section or should there be a rib on the top for support? HAS ANYONE ACTUALLY MADE ONE TO USE BEFORE? the shape cosmetically I'm confident I can produce, but I'm worried about function. Thanks for your time, Brent PS NO he's not a ninja. He's a commercial fisherman so I guess he just likes all hooks and nets.